Shop with AmazonSmile and Donate to Histiocytosis Research at the Same Time! 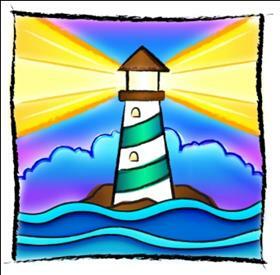 Liam's Lighthouse Announces 2 new social media sites! Subscribe to the liam's lighthouse foundation mailing list. In this quarter, LLF became eligible and received a donation of Office365 for Nonprofits from Microsoft. This is a no cost upgrade for LLF to better serve histio families, private donors, corporate sponsors and our Medical & Research Advisers. Since the LLF Board is spread across the United States, it will allow LLF Board members to communicate documents internally, host live webinars with physicians and plan for events and the future of Liam's Lighthouse Foundation. Amazon will donate 0.5% of the price of your eligible AmazonSmile purchases to Liam's Lighthouse Foundation whenever you shop on AmazonSmile. AmazonSmile is the same Amazon you know. Same products, same prices, same service. 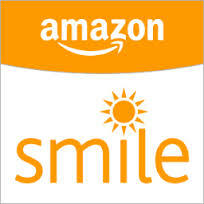 Support your charitable LLF by starting your shopping at smile.amazon.com. 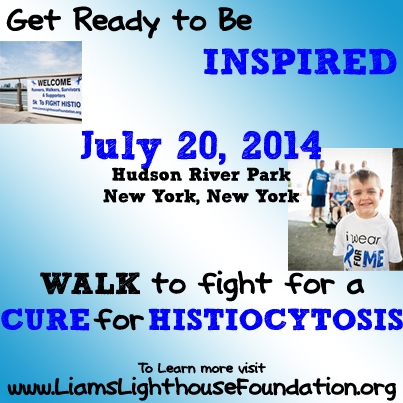 Get ready to be inspired, moved, and motivated when you run/walk in step with others affected by histio on Sunday, July 20, 2014 in Hudson River Park, NYC. From the very start to the emotional crossing of the finish line, you will be amazed at the strength, power, and determination of our survivors, friends and family and histio community. Together, we run/walk to raise funds for ground breaking research, to increase awareness of a disease that all too often goes misdiagnosed, and to provide support to each other as we fight histio. What started out 5 years ago as 3 friends trying to support a grieving mother who lost her 20 month old son to HLH, has grown larger and faster than any of us could have imagined. Every step taken and every dollar raised brings us closer to the ultimate finish line...A CURE! Reminder: All who plan on attending the dinner cruise the evening of July 20th must RSVP now HERE. 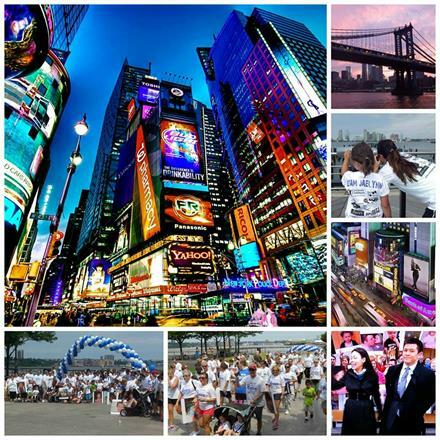 This year's winner has won a gift that will help capture all of the great memories of the 2014 Histiocytosis Awareness Campaign in New York City! The winner will receive a Histio Blue 16MP Canon Digital camera complete with an SD card and carrying case! You are our 2014 winner! Early in March we received a progress report from Dr. Michael Jordan on the research project LLF is funding for Cincinnati Children's Hospital in Ohio, USA. The focus on this project is Developing Gene Therapy for Hemophagocytic Lymphohistiocytosis. LLF Welcomed HLH advocate Amanda Majusiak to the board in January as the new Website Developer & Social Media Outreach Coordinator. Amanda is married to HLH Survivor Eric Majusiak. She graduated from Rowan University with a Bachelor's Degree in Geography with Concentrations in Planning, GIS & Cartography and Geosciences. Amanda specializes in project tracking, databases, Geographic Information Systems (GIS) and website management. She currently works for URS, a leading provider of engineering, construction, and technical services for public agencies and private sector companies around the world, on a contract supporting FEMA's Flood Map Program. 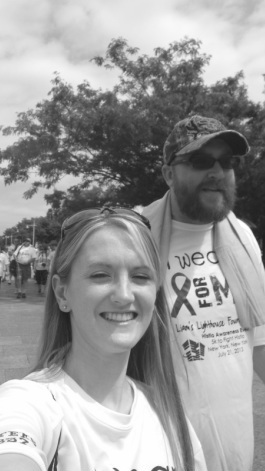 She came across the Liam's Lighthouse Website just after her husband Eric was diagnosed. "Michelle's organization opened our minds to all the possibilities out there for increasing awareness for HLH, but most importantly - We didn't feel alone anymore." The experiences with Liam's Lighthouse's first ever 5k To Fight Histio in NYC in 2013 left a mark on their hearts.Their love for Liam, his courageous battle and this cause grew stronger. "We are forever dedicated to raising awareness for Hemophagocytic Lymphohistiocytosis. "